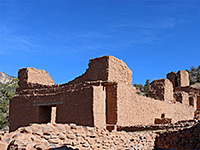 Jemez Historic Site, formerly known as Jemez State Monument, protects the ruins of a 17th century Spanish mission, centered on a large church, together with the remains of an earlier Native American pueblo (Giusewa), established around 1500. 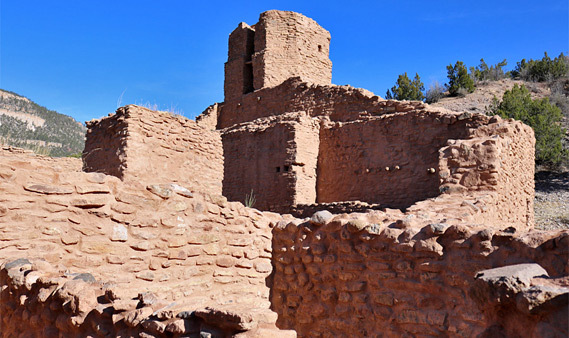 The same combination is found at several locations elsewhere in New Mexico, most famously the three units of Salinas Pueblo Missions National Monument, and the Jemez site, while less well known, is comparable in scale and importance. 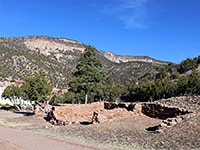 This site, also a National Historical Landmark, has a secluded setting in the deep valley of the Jemez River, towards the south side of the Jemez Mountains, 13 miles from the mouth of the canyon at the community of Jemez Pueblo, or Walatowa. 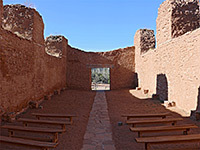 Walls of the church survive nearly to roof level, up to 40 feet high, and the building is connected to a dozen or so other rooms from the mission, while the pueblo is also adjacent, its relics including several sets of rooms, with generally lower walls, and one large, fully restored kiva. The ruins may be toured by a 1,400 foot, partly paved, partial loop trail, and are accompanied by an informative museum. About one hour is the minimum time needed to explore the whole site. Parking for Jemez Historic Site is right beside the main road through the Jemez Mountains (Hwy 4), directly opposite a much more recent religious building, Mary Mother of Priests Church, built in 1962 on the site of an old hotel. Admission to the ruins (2019) is $5 per person, and entry is through the museum, which is open all year though closed on Mondays and Tuesdays. A detailed trail guide is available, describing 24 points of interest. 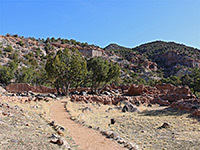 The loop trail starts beside some low wall remnants from the pueblo, only recently excavated, and soon reaches a large kiva, a fully restored structure that can be entered by means of a ladder, but not photographed inside. Two other kivas have been identified but there is no trace above ground after they, like some other ruins, were re-covered for preservation. Next are two more sets of walls from the pueblo, opposite unexcavated rubble mounds, before the main building at the site, the mission church, which has long since lost its roof and part of the upper walls but remains large and imposing, and is still used for occasional ceremonies. Most of the interior is occupied by the nave, which has steps up to a chancel at the north end, and a passageway leading to an unusual, octagonal belltower. 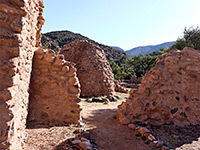 A suite of subsidiary rooms adjoins on the east side, including the priest's residence, beyond which are other rooms and wall fragments, extending to the rim of a seasonal creek flowing down Church Canyon, a tributary of Jemez Canyon. 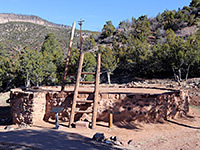 Giusewa is a Towa word meaning hot springs, features which are scattered along the upper reaches of the Jemez River canyon, and was the name given to the pueblo founded in this location by the ancestors of the present day Jemez peoples, sometime in the early 16th century. 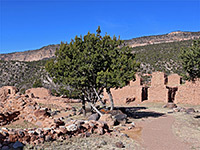 Spanish missionaries visited the area from 1581 onwards, as part of efforts to convert the local population to Catholicism, and in 1598 they established a mission right beside Giusewa, San Jose de los Jemez. Construction of a large church began in 1621, and was complete by 1625, however the mission was short-lived, and had been abandoned by around 1640, partly because the local people proved uncooperative. 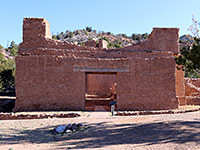 Giusewa also soon became disused after the inhabitants moved to a more spacious location at the mouth of the canyon, location of the present-day Jemez Pueblo, after which the buildings of both the mission and the original pueblo gradually decayed, until the first preservation efforts, in 1910. The ruins were acquired by the state in 1935.